The LSU Journal of Energy Law and Resources is a student edited academic journal focusing broadly on energy and its relationship to other areas of law. The JELR was created to promote the study of energy law and the effects of technological innovation on a local, national and international level. The journal publishes a variety of energy-related topics ranging from oil and gas regulation to nuclear plant licensing to the evolving law surrounding shale hydro-fracking to the complexities of climate change impacts across the United States. 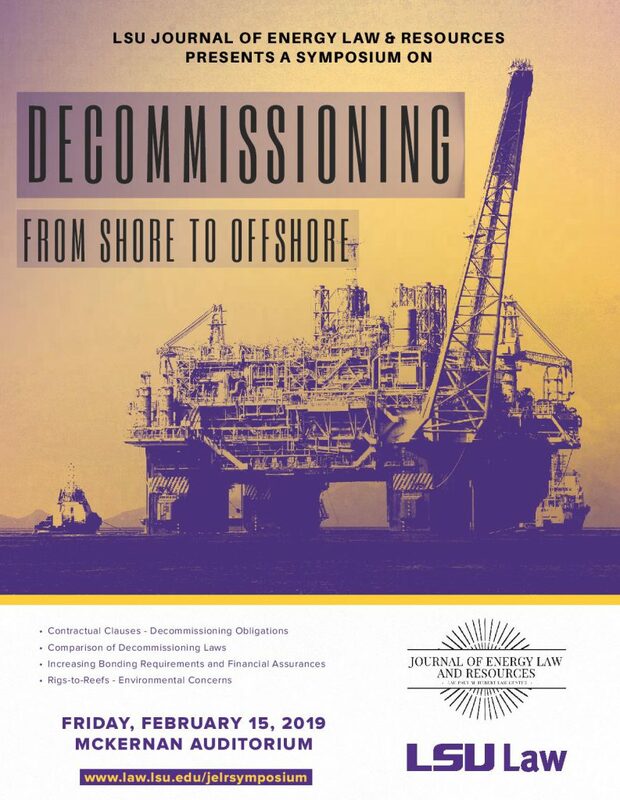 The LSU Journal of Energy Law and Resources 2019 symposium, Decommissioning: From Shore to Offshore will be held February 15, 2019 in the McKernan Auditorium at the LSU Law Center. Five and a quarter (5.25) hours of CLE credit is available. Lunch will be provided. Registration is required.